Well, it should be a very positive article. 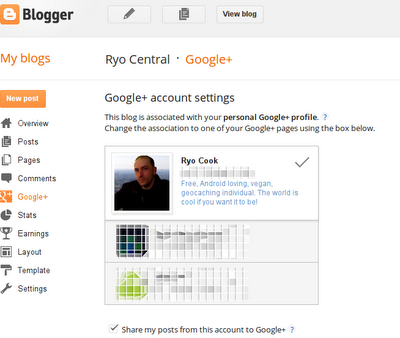 Google+ gets a better integration into Blogger. You now can tier your blog to a page or personal account directly. Very easy and hassle-free. But the Write-API is still missing. And this is a big downturn for everything Google+. I wrote about that problem before, but after all this time, there is still no sign of a write-API for Google+. This is a big deal breaker. Even more disturbing is that some devs get a permission for write access, like Flipboard, while others are left in the dust. I know why Google, Vic Gundotra to be precise, don't like that idea. He fears the automated Twitter-posts and Facebook-statuses fed into the G+ stream. I can see that. But the problem is not as big as losing the ability to share your important things. As long there is no way for any app or program to post stuff of any kind, there is no way for me to say "Circle me on Twitter and get all important updates". I have to give them my Facebook or Twitter stream. Yes, I want to post when I check in with Miso when watching a TV show. I want to post my current location with Foursquare. And I 100% HAVE TO get my blog-posts I write from my mobile into my Google+ stream, instead of the desktop-only manual extra step to publish a just written post. It's ridiculous. If someone don't like that, fine. Uncircling me is just a little click. Or not circling me in first line. But some people like to know what I'm doing, writing in the net. Some even want to know what I eat (oh noez, food pics!). And that means as long as there is no open write-API for everyone, Facebook and Twitter is still more important, because there you can find my life. Not on Google+ up until now.